Asked for some comments on the Chinese atu. I get no benefit from the site or anyone else for this. The kit is about as cheap as it gets and I think you would be hard pressed to find all the bits for less than the ebay site charges. The documents and instructions are a bit odd though and I have been asked to build one for someone and take photographs as I go. Will add the photos a bit later. 1. The small PCB... the switch provided does not quite fit into the PCB holes so you will have to use either small wire extensions, file the holes or file the switch contacts so that the switch fits. I used a different DPDT switch that fitted a little better. 2. The capacitor on the PCB maybe in the wrong place. 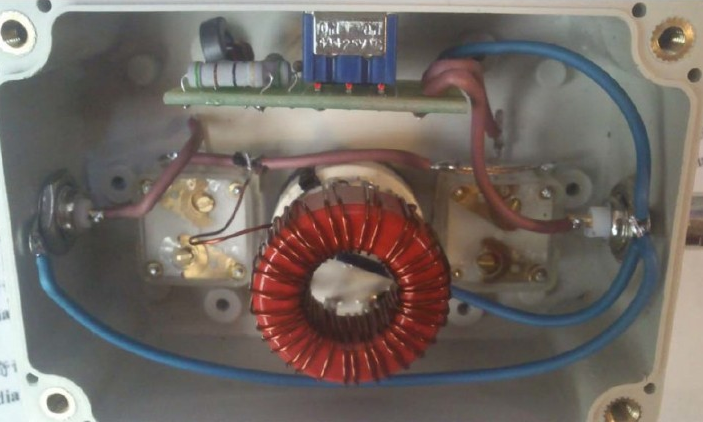 It does not go across the transformer secondary. I have two different PCB and on one it goes from the diode to ground, which is where it is supposed to. You have two ways of dealing with this, either solder the capacitor on the bottom or you could drill another hole next to the diode hole and folder one leg over and solder it in place. 3. The 1K resistor in series with the LED might not be bright enough for some, if not you can swap for say a 680 ohm resistor. 4. 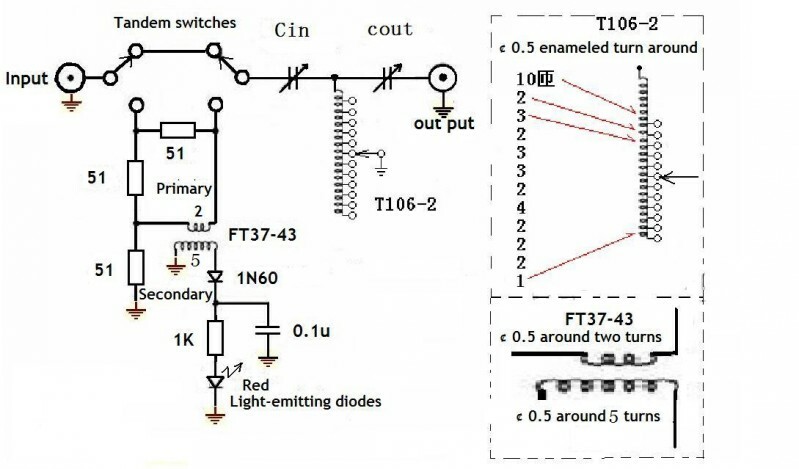 The T106-2 winding is probably the thing that most will have a problem with and it is worth spending time to get the taps to line up with the switch. You will need 36 turns with taps on the main inductor. This means if you start at one end you are going to be winding a 1.6 metre long length of wire initially. This works but I found it easier to start at about the mid point of the wire provided (you wind the transformer for the VSWR first) and put a twist in (use the switch as a former). This will become the 5th tap point on the switch. Then wind on turns and add taps as needed until you get to the end of the wire (I did this for the 10T tap end first). So counted 3T, tap, 2T tap, 3T tap, 2T tap, 10T and to position 1 on the switch. Then on the other side.... 3T tap, 2T tap, 4T tap, 2T tap, 2T tap, 1T and onto position 12 on the switch. Do NOT cut off all the 10T end excess wire you will need about 2-3" left on. Note you will want the taps to be regular spaced to line up with the switch so put them on one outside edge of the T106-2. 5. Note the 12 way switch really is that... however you might find it doesn't seem to switch more that 5 or 6 positions. Do not panic you have not been sent a dud. Take the switch nut and grip washer off, you'll find there is a washer with a tab that is slotted into a hole on the switch. As we want ALL 12 positions you do not want any to be used so I cut the tab off and put it back in place. You could just turn it over... and add a small slot in the switch hole to allow for it. 6. The VSWR transformer the primary is 2T and the secondary is 5T. Make sure BOTH sets of windings are passed through the same way. On the PCB the primary is the 'IN' the secondary is marked 'out'. You can mount the torroid vertical or horizontally. 7. The provided 51ohm 2W resistors are obviously bigger than the ones used originally to make the PCB so you need to bend them with one leg at 90 degrees to the body, the other you bend the leg in slightly under the body as well. 8. The LED will fit into a hole in the box so you should bend this over at 90 degrees. It will fit in a hole you cut, when the switch is put into the box (attached to the PCB) so it might need a bit of adjustment to the leads. The instructions show fitting the capacitors and the switch first to make sure they fit. Note drill the deeper half of the box! Drill BEFORE you add anything. Now you can use the templates provided and stick those to the box, or not choice is yours. I drilled all the holes using a drawing pin to punch a hole in the centre of the templates held against the box (didn't use the templates). The ebay trader provides BNC connectors. I was asked to use phono connectors. The final wiring up is probably the most troublesome. The first kit had horrid wire so I used some 5amp blue and brown from mains flex. The second kit provided some red and yellow cable. 1. Fit one length from one of the BNC tabs all the way over to the other (pushing the cable to the side of the box. 2. Take a length of the same cable about 3" long and fit one end to the GND on the PCB. Take two more lengths of cable (different colour is used in the pictures) one about 2" one 3" and strip and tin the ends.and fit the shorter one to the OUT on the PCB, fit the longer to the IN on the PCB. 3. Take the two capacitors and fit them to the box, add knobs now or later doesn't matter. Take one long length of wire about 4" and strip about 3/4" insulation of both ends. solder the ends to the outer tabs of both capacitors with enough flexible in the middle to allow space to fit the switch and torroid (might need to offer it up to check. You want the wire to be free of the body of the switch. One way is to hot melt glue it to the box. 4. Take a 2-3" length of wire and strip and tin both ends. Solder to the central connector of the ANTENNA side and the other end to the centra lead from the left hand side capacitor. 5. Now fiddly bit.... take the nut and lock washer off the PCB mounted switch and push it in the hole, then fit it into place. Make sure the LED goes through the hole you made. (you could hot melt or glue it in place) You will then have the two BNC, two caps and the PCB in the right place . 6. Solder the central lead from the PCB you have in place (short one) to the central tab on the right hand side capacitor. 7. Solder the remaining PCB lead to the centre of the RIG side RF connector. You might have to trim the wires to fit... the lengths I give are approximate. 8. Add a length of insulated cable to the central pin of the switch and feed it out between the switch pins and the torroid, or of through the hole. both seem to work. The other end (10T end) keep the enamelled wire lead long. Then fit the rotary switch into the central hole in the box WITH the torroid attached. Then make sure it is tight as this will be rotated. 9. The 10T end enamelled wire solder to the wire connecting both capacitors, the easiest place might be on left hand capacitor tab. Solder the lead you added to the switch central pin to the GND connection on the RIG side. That's it the wiring is all done. Fit the knobs and you are ready to use. The trimmer caps on the capacitors you should set then so that are fully messed so you will have the capacitance available from them (few pF at most). The white rubber string thing is a water seal, mine was a bit longer than needed. You fit it into the box lid, I used the end of a slot screwdriver. To use you switch IN the VSWR meter, adjust the C and L until the LED light dims the most or goes out. Use dit dit dit on your TX as the vswr could be way out!. Once tuned switch the VSWR out. I think you 'could' replace the LED and 1K resistor with a tiny 50uA edge meter. CARE: Watch out the capacitor mounting screws CAN be too long, do not put them in too far (use washers or a spacer (piece of plastic off cut from an old credit card works well)) or else it will be terminal for the capacitor. "I am almost finished with it but cannot find anywhere where to solder the end of the enameled wire that makes the inductor. Your instructions say the end nearest the ten windings attaches to the wire between the capacitors I believe. But where does the other end attach to? To ground? I can't believe it remains unattached." Look at the circuit diagram and then re-read the whole of the steps to winding the toroid .... and then think about it. Position 1 should be the 10T tap, position 12 on the switch should be ALL the windings, so the end of the wire. You spread the winding over the torroid and have the switch select different L values. If you have filled all the switch positions and have wire left you have added 1 too many tap points. Either reorganise them or use the tuner without the extra L 1 turn or whatever will give you and cut the bit of wire off at the 12t switch position (you really should reorganise, don't rewind the whole thing just desolder one of the taps move it away from the switch (use a bit of tape so it doesn't short circuit or anything and move the others along one position (near the 12th position end) then solder the wire end to the 12th position. I would make sure you have ALL the windings sorted before soldering to the switch. Hi, I was just wondering if you had any comments on how well it worked and with what antenna configurations? The tuning is very sharp. I've tried it on a couple of different dipoles 15m, 20m and 40m. Verticals and long wires again it worked but not on 80m, did not seem to have enough C.
It appears that the file on your box account is no longer available. 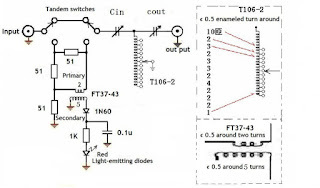 Do you have another source for the schematic? Any idea what "QRP Manual Days Antenna Tuner Tune DIY Kits" means? What is a "Days?" The circuit I have added as an image. I have no idea what "Days" in the translation meant as far as the original author is concerned, probably meant Days. I suspect the title should be something like ... QRP Field Day Antenna tuner.... might make more sense. Mine works, but the LED gets brighter when the SWR goes low and vice versa, i.e. the wrong way around. I've checked and I have the in out connections correct to the circuit board and the secondary toroid the right way around. Not the LED itself, 'cause if it was the wrong way around it wouldn't conduct/light. I've obviously done something wrong, which must be simple, but I'm having a senior moment and it isn't coming to me. Problem is that when they translated it they separated 天 and 調. The character 天 means "heaven", but also "day", while 調 means "tone" but also "tune". At current prices, the price of this tuner is close to the cost of the parts, making it a good deal. And the case is high quality. "A QRP Console" DeMaw, QST, Sept. 1970, p. 23-25. The SWR meter is a creation of Tayloe. It's probably better to build this tuner according to these two sources: Same parts. At least the builder will have good directions. No kidding about having readable instructions! I looked up the 1970 QST article by DeMaw. There are similarities: It contains two variable capacitor and a variable inductor. But the DeMaw article has them in a pi-arrangement, while the Chinese tuner has them in a T-arrangement. So they are not really similar. But were you perhaps suggesting that it would be a good idea to rearrange the Chinese tuner into a pi? Sverre/Thomas.... Thanks both for comments. I am not suggesting any deviation from the Chinese tuner on these pages, I included the build instructions in a slightly clearer form as some were challenged with the Chinese instructions. This page is all about how to build THIS one not create your own. We all know how to obtain details from other references for Pi and T tuners using a couple of poly-variable caps and an inductor, there are probably 100's of variations in the home-brew space this page is not about that. I am sure I might have a page that talks about other tuner variations. For those that need/want a cheap tuner this seems to fit the bill. My kit came with countersunk screws for the variable capacitors so I counter-sank the holes and possibly butchered the capacitors. With the 2 sections in parallel each capacitor measures a total of 42pF, much less than I would have expected. Maybe I've been provided with fm rather than am capacitors? Has anyone else measured theirs? hi everyone..i am a new builder and new to HF QRP. Ive tried to assemble the kit based on the instructions and reference to this blog and youtube. however, while installing the selector switch to its knob, the selector switch popped and a small ball bearing came off and it seems not to select anymore. I have manage to find a replacement on ebay. For the capacitors, the small nut which goes between the knob and the capacitor is too large for the screw size provided therefore i cant seem to connect the knobs to the caps. Any ideas on this? I would like to also inquire, what are the specifications of the two variable capacitors as i would want to purchase replacement. (specs and capacitance). It would be very helpful if I can get these information from you experienced HAMs. About the toroids as someone asked.. The RED T106-2 about 1" diameter is in the ATU.